If President Obama's rhetorical flogging of video games has you in high dudgeon, the ECA's built a form letter enabing you to point out to the White House how "video games can empower and educate." The Wii's exergaming influence and the industry's overall sales and market figures are both cited as examples of video games' legitimacy in American society, in the form set up by the Entertainment Consumers Association. Of course, you're free to hit the backspace on all of it and write your own ode to how Saints Row II made you a better citizen, if you so choose. "As a gamer and a voter, [the ECA is] asking you to email President Obama to point out some of the ways that video games have empowered and educated you, as well as their power to build teamwork and make people healthier," says the ECA's Brett Schenker, the online advocacy manager. 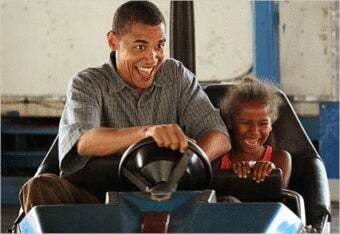 Obama's beaten up on games in a few speeches lately, asking parents to shelve the Xbox (by name) and make sure the kids observe a decent bedtime. Sounds like that has as much chance of solving the nation's problems as lecturing the president about scapegoating games.